“Prevention is better than cure” as they say, and, as a back pain and sciatica expert, I couldn’t agree more. So how does one ‘prevent’ back pain? The best place to start is with your posture. Your posture can have a huge bearing on the amount of stress that is placed on your back muscles and the resultant back pain that will undoubtedly follow after years of having a bad posture. Always be very very conscious of your posture, especially when you are sitting and standing. Recognise that diet plays a key role. A healthy, balanced diet will help minimise the stress your body is constantly under because it feeds the body with essential nutrients that in turn help you to recover and regenerate. The right diet makes a body supple and naturally strong while the wrong diet leaves a body weak stressed, weak and tight. Keep your body balanced and flexible with the right exercise program for your level of health and fitness and get regular massage. In general terms most back pain results from an accumulation of stress in the body from either physical, emotional or chemical imbalances. When you overuse an area of your body affected by this stress you can cause muscle fatigue or spasm, then irritation and finally inflammation and chronic pain. It is important to know and understand yourself well enough to identify the causes of your stress and learn how to deal with them on a day to day basis. When you injure your back, don’t waste time, money or both on treatments that don’t work. If the therapist or doctor is good at what they do, the results should be quick and lasting. Stay committed to whichever program works for you, try not to cut corners and keep your eyes focused on the goal – achieving a quality lifestyle free of pain and frustration. Take a pro-active, involved role in your recovery. For best results, get a good understanding of what is wrong with your back and seek out the right treatment for YOU. What works for one person doesn’t always work for another. Look at all your options before you make decisions that are going to cost valuable time and money and never, ever think of your condition as incurable. 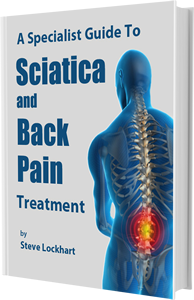 I would like to tell you the story of Mary, a typical 20-year-old who worked as a waitress, went out with friends and enjoyed her lifestyle to the fullest until a fall at work caused sciatica pain from a bulging disc in her lower back. After numerous visits to the specialist and referrals to physiotherapy she was no better. Nine months after her fall, Mary was told that nothing could be for her. She was referred to a pain management clinic which would help her to learn to live with her pain. Not being content to accept this for the rest of her life, Mary began her quest to find alternative treatments that would rid her of her pain. She didn’t want to learn to live with it, she wanted to live without it! She eventually found a unique program that focused on correcting and re-aligning the underlying muscle imbalances that were caused by her fall. The treatment involved a one hourly treatment each week followed up with exercises she had to do at home for 1 hour a day. After four weeks, Mary had improved significantly, she came off all medication and was able to keep her discomfort to a minimum with gentle daily exercises designed specifically for her. In Mary’s case, her decision to exhaustively search for a an alternative treatment rather than accept the prognosis from her specialists led her to finding a cure, but there are many other sufferers who have not been so resourceful or so lucky and have just given up, accepting that pain is part of their lives every day, for the rest of their lives. Up to 80 percent of adults will experience some form of back pain at one or more times in their life. At least 50 percent of them will never find out the cause of their pain. This is probably because 85 percent of back pain can be attributed to muscular causes. Only 15 percent of back pain causes are able to be diagnosed using an x-ray or scanning equipment. Unfortunately medical specialists rely on this equipment to discover the cause of a person’s pain which is why many of them are left in the dark and unable to give a confidently give a correct diagnosis or prognosis. A recent study published in the British Medical Journal dispelled a common myth that people who suffer from back pain will get better within 6 to 12 weeks, regardless of the treatment they receive. The study found that this belief came about as a result of statistics drawn from doctor’s appointment books. When the majority of patients went to their doctor for lower back pain and the treatment was not effectively addressed, the patients did not return for further treatment. This led the doctors to believe that their patients had been cured when in fact it was found that even after 12 months, only a small minority of people reported a full recovery. Back Pain is not an illness. It is the result of cumulative physical, emotional or chemical imbalances in the body that have manifested themselves as stress. When the body is subjected to exertion and ‘over use’, these imbalances cause irritation and inflammation resulting in pain. If imbalances and stress in the body are left untreated, the body starts to compensate leading to wear and tear on joints including the vertebrae, discs, muscles, nerves or ligaments and weakness in various parts of the body. If the resulting pressure or tightness cause by imbalances in the body are severe or left untreated, more serious problems can occur, causing pressure on nerves and resulting in acute pain episodes that can last weeks at a time.